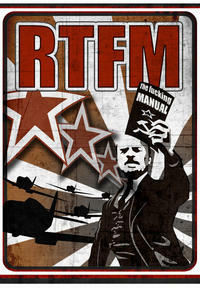 "RTFM" is "Read the F*cking Manual". This is a harsh and impatient response that says "your question could easily be answered by basic working knowledge or by reading the documented instructions". 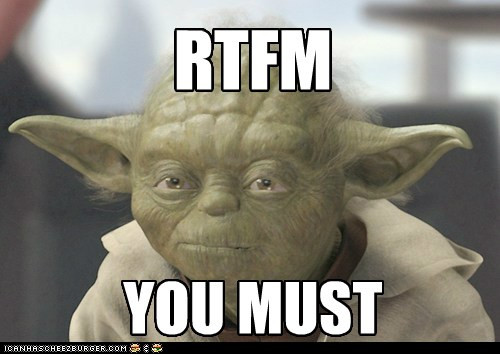 You will see RTFM used in discussion forums, online gaming, and in office email conversations. In almost all cases, the usage will be from a mean-spirited veteran who is mocking someone for asking a basic question. In some cases, however, the person in question will deserve the hostility if their question is so basic that it demonstrates incompetence. How do you turn on a computer? RTFM! How about pressing the button that says "power"! I think the above poster should RTFM... the way you reply in this forum is by pressing the button clearly labeled "reply". Dear god, Jeffrey doesn't even know how to save a file! RTFM fer chrissake... why did we hire this guy? 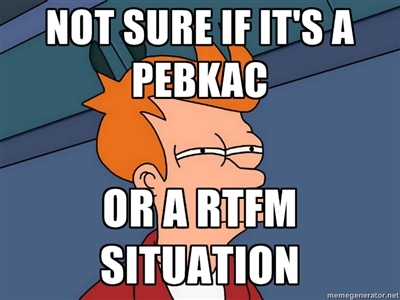 The RTFM expression, like many cultural curiousities of the Internet, is a part of modern English communication. The first recorded printing of RTFM was the LINPACK user guide that was published in 1979. 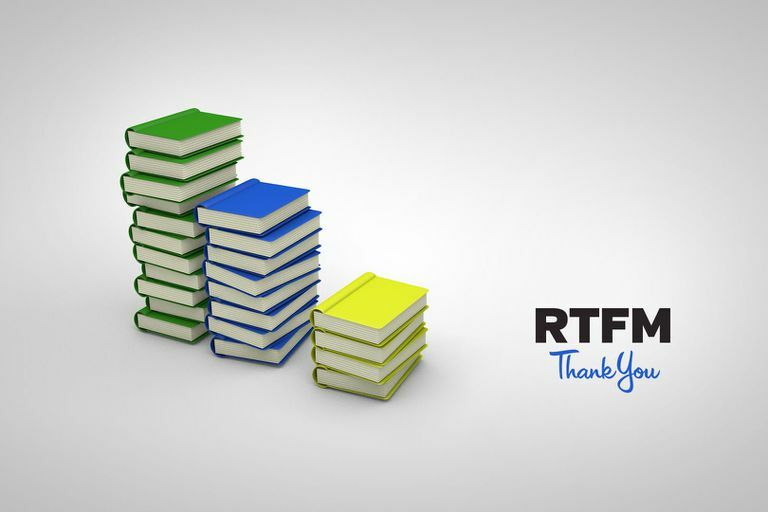 While there is no verifiable origin of the RTFM acronym, it is believed to have originated with the US Army in 1939, after it had produced documents called 'Field Manuals'. These manuals explained how soldiers would perform many regular tasks, like firing their weapon, throwing hand grenades, cleaning their garments, folding clothes, and preparing their uniforms for inspection. As would naturally happen, the soldiers who were trained through these manuals would then scream 'RTFM' and 'Read the f*cking manual' to the new recruits whenever the recruits would ask dumb questions.